Art can be even less forgiving than the folks I just offended with “dragon lady,” a stereotype of bossy Asian women. Artists are exiled to obscurity with judgmental terms like “derivative,” “contrived,” and “traditional.” They might proceed from an established path and join the avant garde. Dare they backtrack, they’re dismissed as hacks and drones. Freelance art director and concept artist Jacqueline “Jax” Jocson absorbed the history of movie effects and game illustration while earning a Bachelor of Fine Arts degree in digital Media and Photography from the University of Houston and a master’s in Fine Arts in Digital Media and Animation from the University of Southern California. Her game developer clients trust that her original dragons and superheroes are true fantasy creatures that weren’t recycled from other digital battlegrounds. Jax is best known for her work on the 2014 mobile video game Vainglory from Super Evil Megacorp. In this multiplayer online battle arena (MOBA), she was the character concept artist behind the two dragons, Blackclaw and Ghostwing. Designing the dragons for the Vainglory 5v5 mode was an exhilarating experience and one of my favorite designs. Vainglory is a MOBA for mobile, so our players are using a phone or tablet. With so many characters, VFX, and animations happening all at once, especially during a dragon fight, characters need to have clear silhouette pops. Designing an iconic head shape with a crest and underbite and team markings, so he is a very specific dragon, was one of the best parts. The art team did a great job making this bad boy come to life on screen. Designing skins for existing Heroes is a great assignment - as the designer you have to stick to the Hero's archetype and gameplay, but give it a fresh new spin. Glaive plays how he looks- big and strong! He comes sweeping into a team fight suddenly and stuns an enemy with his weapon. 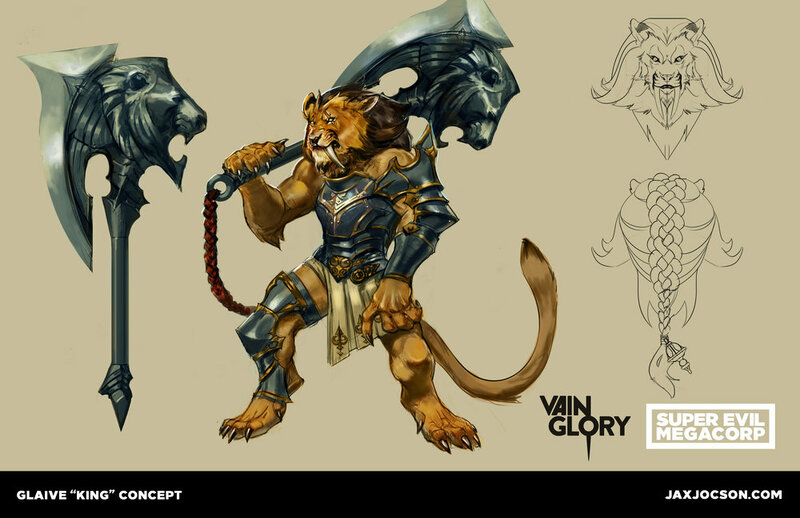 This design was fun to execute, especially his fluffy mane, ornate hair tie, and his regal, gladiator outfit. These images were incredibly challenging as they had to be large enough to wrap a building, a bus, a billboard, etc. 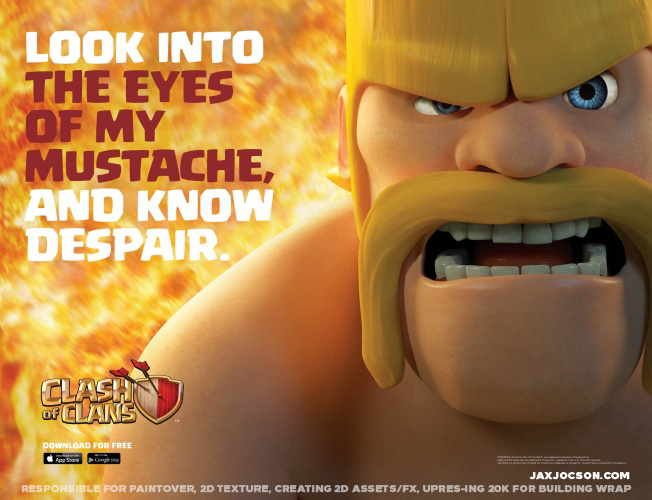 I had the pleasure of working with Psyop, an advertising agency in Los Angeles on this Clash of Clans campaign with Supercell. For these images I was responsible for paintover, 2D texture, creating 2D assets and special effects, and up-resing the image. She was born in Chicago, grew up in Houston, and lives in San Francisco. Her parents, Eileen Ehret and Daniel Bolanos, are the children of immigrants from Batangas and Manila, respectively. Jocson is the maiden name of Jax’s mother. Pre-holiday get together with my family - from left, myself, my mom (Eileen Ehret), grandfather (Mike Jocson), sister (Ava), grandmother (Linda Jocson), and youngest sister (Anna). In 2014, I had the opportunity to work with Stan Lee pitching IPs. Discussing character design and storytelling with the co-creator of so many iconic stories was an amazing experience. My good friends (from left) Anthony Francisco, Lidat Truong, Polina Hristova, and Carlo Arellano. Artists getting creatively refueled at NBC Seafood in Los Angeles. Our conversation was scheduled for 15 minutes but lasted an hour. She peppered the conversation with analogies of nomadic tribes and blacksmiths, tributes to Filipino cooking, and a load of URLs to check out. Students at San Francisco’s Academy of Art University are likely familiar with this human bibliography on computer gaming and Filipino culture. She would definitely impress Batman archenemy, the Bookworm. As a second-generation Filipina American, she takes a personal interest in the success of Filipinos in the comic and gaming industries. First on her list is Tony De Zuniga as a pioneer for his illustrations for the Dragonlance comic and Dungeons & Dragons and co-creator of Jonah Hex, a comic book antihero who eventually reached the big screen in 2010. Jax’s admiration extends to illustrator Alfred Acala whose characters, including Conan, have “hapa” Anglo-Asian features that could be seen in their large eyes, round faces, strong noses, and jawlines with delicate chins. Other Pinoy artists she finds inspiring are Nestor Redondo and Alex Nestor, both of DC and Marvel; Floro Dery who contributed to the “Spiderman” animated series of the nineties, William “Whilce” Portacio of X-Men and Spawn; Danny Bulandi of Captain America, Indiana Jones, and Xena fame; Armand Serrano who worked on Lilo & Stitch, Mulan and Tarzan for Disney; and Rodney Fuentebella, whose talent will light up big screens in the next Marvel blockbuster, Avengers: Infinity Wars. Close friends in the industry include Daniel Cabuco of Legacy of Kain, Tomb Raider, and Lost Planet 3; and Carlo Arellano of World of Warcraft, Dungeons & Dragons, Planet of the Apes, Spiderman, and God of War. Megaphonic kudos go to pal Anthony Francisco, Black Panther Visual Development team member whose Dora Milaje warriors wore Filipino beading. USC (University of Southern California) is conveniently close to the Natural History Museum of Los Angeles, which is where I spent hours studying from fossils and dioramas. Displayed are three T. rexes ages 2 years old, 13 years old, and 17 years old. Her list of Filipino peers represents a significant portion of the few artists who make a living in the industry. Development teams are spread thin among the major studios. She compares competition for one of typically seven berths on a team to making an NBA roster that pays one-tenth of an average player’s salary. Jax’s list also stands out for its absence of women. Filipinos in game development are on the rise, but their Filipina counterparts remain outsiders. Jax’s classes at the Academy of Art offer a preview of the changes to come. “Half the enrollment in my classrooms is female,” she notes. My "Monsters vs Mechs" Character Design class on a field trip visiting CuriOdyssey, a science museum and zoo in San Mateo, CA. We are able to get up close to wildlife such as bobcats, foxes, reptiles, and birds of prey including vultures, kestrels, hawks. By implementing design methodologies such as ROAR (Research, Observe, Analyze, Realize) and designing from real life, we can ground our concept designs in realism, making them more believable. The first half of the class is focuses on creature design, and for the midterm the students must design their own Kaiju. For the second half of the class covers hard surface and mechanical design. Students visit the USS Hornet to study hard surface in person. They must design an a Mech (like the Jaegers in Pacific Rim) or an exosuit for their final. It's incredibly rewarding passing the torch onto the next generation of designers and seeing them grow even in a span of a semester. I tell my students there are two rules: do good work and be nice to one another. If you follow those two rules, you'll be fine. The achievements of one conceptual artist do at least signal a thaw in the macho nerd bloc. From time to time, society reaches these crests that trigger self-correcting actions. For women and Filipinas in game development, Jax is the first shot across the bow. Anthony Maddela is involved in public housing and workforce development in Los Angeles. He is originally from Seattle.